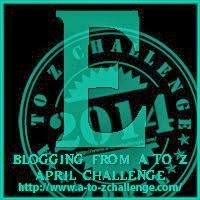 Today is day five of the A to Z Blogging Challenge! Moving right along!!! Since my theme this month is "about ME" I decided that E would be for Exercise! First of all, I hate to exercise! I can't think of any exercise that I really enjoy! However, at almost 60 years old (yes, I said 60!!!) exercise has to be a part of life to stay happy and healthy! I have a treadmill that I have been using for one hour per day and I am up to 3 mph:) I am trying to work up to an incline of 4% but fell in January and hurt my back so am still working up to my incline goal. I also have a nice weight setup in my home gym but haven't started using it yet. I plan to make a weight workout schedule when I get home because I know weight bearing exercises are so important as I get older...for bone density, weight loss, toning. Do you like exercise? What is your exercise of choice? For the A to Z Challenge, Sunday is a day off. However, I will be back for Carla's Sunday (Night) Chit-Chat. Can I really blog seven days a week for a whole month?!!! I don't like to sweat either but at this age, I need to exercise to keep mobile! I went to Curves a few times with my sister and loved it but we don't have one close! For me, it's walking, swimming, plus rock climbing in season. Does the trick nicely. Stationary bicycle set up facing the TV. Unless my blood sugar is low, I cycle whenever I watch TV or a DVD. I have a TV on the wall in front of my treadmill:) Makes the time go by faster! Stationary bicycle would be fun! I don't like exercising much but I LOVE swimming and walking. Now that the days are warmer again I hope to be able to walk 5 miles a day again. I hate exercising but I love how it makes me feel, lol. I do love biking and I like walking, and I like swimming but I'm not very good at it and I don't have opportunity to do so very often (no pools or bodies of water nearby). There you go, Jaimie! I do like how exercise makes me feel! Plus I feel like a success when I get finished:) When the weather warms up a bit I will start riding my bicycle. We don't have water close either but have been trying to talk hubby into an above ground pool. My hubby and I love walking. We walk at least two miles a day. I wish we had time for more. Have a great Sunday. I really like walking with my hubby but his schedule doesn't allow us to do it often so the treadmill it is! Commenting from Write On Mamas. I am one of those weird people who likes exercise- most times. Although I found myself last week lifting weights then coming to the kitchen & eating chocolates- so I know why I ma not seeing the results I had hoped for. I use DVDs to walk me through weights otherwise I'd be bored & quit. I would really like to LOVE exercise! Just don't think it's ever going to happen. I would much rather be crafting or knitting or blogging:) I do need a DVD weight program...would make it much easier. You're not alone in the age stakes Kathy! I'm older than you and doing the exercise gig for the same reasons. I want to be sixty and sassy so I'm happy at the gym and recently booked six more sessions with a personal trainer which has been a real motivator. I would love to have a personal trainer for a bit but we live 1 1/2 hours from the nearest gym:( Rural living has it's downsides. If we don't work at being active now we will be using canes and walkers! Not in my 10 year plan...20 year either! I know I should be doing more, but mostly am just walking and gardening as the weather gets warmer. I have been walking for 20 to 40 minutes to work and back every day as we have car issues right now (and sometimes longer if I have shopping or meetings close by) The exercise bike is in front of the TV downstairs, but I don't use either one very much. Sounds good to me!!! I am looking forward to riding my bike as weather gets nicer. Thanks for visiting Marcy!